Unless you are an out-of-touch, just-having-a-good-time, happy-to-get-out-of-bed, a-political American (over half of us qualify), you realize that America has taken a step down in global opinion. This is not about how nice America is, rather the position America has in the world as a global leader. The current leadership is not one we can be proud of as representing American interest abroad. The foreign leaders that prefer the current, weaken state are our traditional "enemies" -- Russia, China, most Muslim countries, Cuba, Venezuela and other Chavenitsa regiems. A strong US president that a) looks out for American interest #1 and b) provides meaningful aid with strings attached, are typically what America has had in the oval office. America use to be respected. It use to be feared. It has quickly morphed into a state with a leader and legislature that knows and cares little about foreign affairs. They are hesitant to act in fear that it may offend another. They put others' agendas ahead of our own. Traditional allies, namely European states and Israel, have less confidence in American resolve to aid in time of crisis. America is not taking firm stands. And if it pretends to, most know that it is just words and little if anything will be done to back up those positions. The latest attacks on American embassies in the Middle East should be seen as nothing more than acts of war against America. The anti-Mohammad movie is just a catalyst and rallying point. The sovereign status of embassies is ubiquitous. The governments of those nations are responsible for ensuring their safety from attack and mobs. These governments shoulder a big part of the mod-rule blame, failing to maintain civility. America's roll in encouraging and aiding the so-called democratic process in these nations is a failed policy. The autocratic governments that have existed for decades in most of the Middle Eastern nations has served America well. We knew what we had. We could manage the risk. 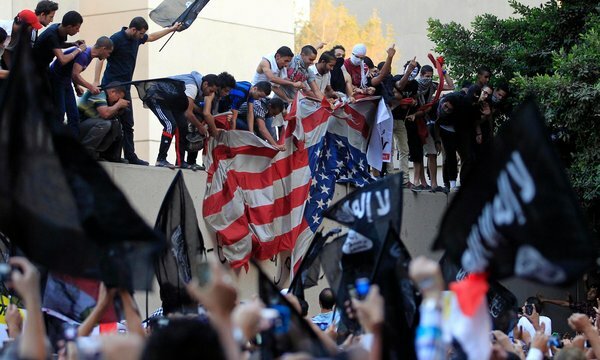 The proliferation of radical Islam states do not bode well for America. They oppose the freedom we enjoy, even if the results of that freedom are debauchery and paganism. The rage against America will continue if the voters continue to favor weak, populists politicians. We are being lead by bad parents that hope to indulge their children's desires, even though those desires have negative long-term effects. When immature leaders lead, they are exploited by other, more savvy and opportunistic nations. America needs a change. It needs to return to a time where American interest are number one, where American might has an element of fear, and where our word is gold.